Welcome to Ten 02, one of Asia’s most elegant jazz venues! It does not matter what brings you to Ten 02 – the tasty menus, a drink and snack after work or an entertaining live show – because once you stop by you will come over again and again. Located in the Scout area of Quezon City, the biggest city of Manila’s metropolitan area, Ten 02 is a new provocative restaurant & music bar. Very well-known in the region for its casual yet elegant interiors and the selection of food, it has become one of the up and coming jazz joints in the Philippines. With a look that takes inspiration from the top-class jazz clubs of the Big Apple Ten 02 attracts locals from every part of the capital region of Manila metro. Don’t get us wrong though, the restaurant & bar is opened to everyone! While it is becoming an institution among local jazz aficionados, Ten 02 does not stop surprising every single tourist who visits it. It can be for a quick drink, an appetiser after work or a bite to eat at lunch. Or, perhaps for a romantic dinner for two… Ten 02 provides a wide selection of services for all kind of customers: ice-cold beers, fancy cocktails, fish, pizza, pasta, delicious desserts and pica. To the “journey of tastes” Ten 02 adds shows and concerts, presenting different music genres. 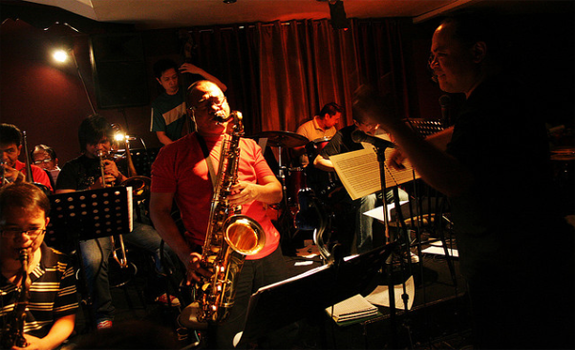 For jazz fans, in particular, Monday night is the right moment to drop by and assist to the live performance of one of the country’s top jazz bands, the Asosasyon ng Musikong Pilipino, commonly known as AMP Big Band. A horn section, upright bass and all instruments typical of this kind of ensemble keep the jazzy philosophy of Ten 02 alive. We could keep on giving you reasons why, if you live or visit the Philippines, you should visit Ten 02 restaurant & bar, but we won’t. All kinds of beverages, delights and entertaining gigs, all this in a very eye-catching and sophisticated location… what more do you want? Write this name down: Ten 02 restaurant & bar… you will love it!